University of Kentucky student Brooke Stewart has been selected to participate in an inaugural leadership program for GEAR UP alumni in Washington, D.C. in June. The Covington, Kentucky native and Holmes High school graduate is among 30 former GEAR UP students selected from across the nation. GEAR UP, or Gaining Early Awareness and Readiness for Undergraduate Programs, is a federally funded college access and readiness program. Stewart was actively involved with GEAR UP while she attended Holmes High School. 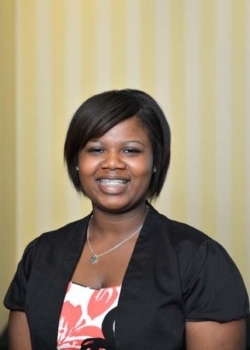 She attended a three-week GEAR UP Summer Academy at Eastern Kentucky University in 2009, was heavily involved in GEAR UP Students Give Back community service projects, and was a recipient of the GEAR UP Drive the Dream scholarship her junior year. Both GEAR UP and school staff frequently called on Brooke to serve as a positive role model and be a representative voice for her peers as a member of school-based committees. Stewart is now majoring in bio-chemistry at UK and training to work as a pharmacy technician. She aspires to attend pharmacy school and eventually work in an urban area as a clinical pharmacist. The academy will offer 12 months of training in leadership development and civic engagement, including the week in Washington. The National Council for Community and Education Partnerships, the training and technical assistance provider for the federal GEAR UP program, sponsors the program. The Kresge Foundation provided funding to support the program. The mission of GEAR UP Kentucky 3.0, the state GEAR UP program, is to build a sustainable college-going culture in schools with a high percentage of low-income students. The GEAR UP Kentucky 3.0 program is administered by the Kentucky Council on Postsecondary Education and funded by the U.S. Department of Education, 2011 – 2017. For more information about GEAR UP Kentucky, please contact Kim Millerd, Communications & Outreach Coordinator at 502-573-4327 .